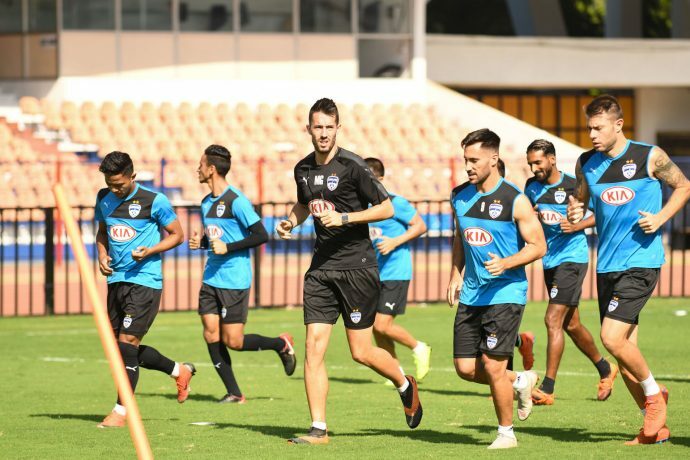 It’s been touted as the perfect pick for a showpiece event by fans and neutrals alike, as Bengaluru FC take on FC Goa in an Indian Super League final that holds the promise of going down as a game for the ages. The sold-out Mumbai Football Arena will see a new ISL champion by the end of Sunday night and Blues’ Head Coach Carles Cuadrat hopes that his men come out victors in what he’s labelled as a battle of heroes. The game also presents Bengaluru FC and FC Goa a chance at redemption after both teams fell short at the final hurdle once before. The Gaurs went down 3-2 to Chennaiyin FC in the 2015 final, while Bengaluru went down to the same opponents by the exact same scoreline in last season’s summit clash at the Kanteerava. While results in the League stages count for little in a format that needs you to have one perfect performance if you’ve made it to the end, Bengaluru will draw confidence from the fact that they have beaten Goa both home and away, this season. The Blues nicked a 2-1 win in Fatorda early in the competition and followed it up with a rousing 3-0 defeat of Lobera’s side last month. However, Cuadrat refused to buy suggestions that the results made his side favourites ahead of Sunday’s final. “In what is a very genuine and honest opinion, I think both teams are favourites. There are a lot of factors that go on to determine a final and as far as the build-up to it is concerned, Bengaluru and Goa have reached this moment with similar numbers on so many fronts. Both teams possess quality all over the pitch and we both like to play football that flows,” said Cuadrat, at the pre-match press conference, on Saturday. Both, Bengaluru and Goa possess game-changing individuals all over the pitch and it could well be one of those names that decide the way the night ends. In Ferran Corominas, Goa have the top scorer of the League (16 goals) for a second season running. And while he has struggled to show any of that form against Bengaluru, the Blues know better than to let their guard down with the Spaniard around the box. Coro has been ably supported by Brandon Fernandes on the left and Jackichand Singh on the right, in attack. The duo, relying on pace, have chipped in with vital goals and regular assists and the Bengaluru defence will have their task cut out. But the back four on the other end of the pitch will also be making notes of their own, given they will be coming up against the attacking trio of Miku, Udanta Singh and Sunil Chhetri. The Bengaluru skipper has a penchant for turning up on the big stage and with Miku showing more than just signs of a full return to fitness and form after a long injury lay-off, Bengaluru could well be calling the shots in the battle of the final third. Udanta too has been a vital cog in Cuadrat’s wheel this season where he has scored, assisted and even tracked back to help out with defensive duties. “Finals, in general, bring out one special performance. It’s happened in games all over the world. Some players shine spectacularly in big games. We have players like Sunil, Gurpreet, Udanta and many others who can shine. The problem tomorrow is that Goa also have many players who can have a great game. Let’s see what happens, hopefully we can stop the Goa players from being heroes,” said Cuadrat. The teams had contrasting routes to the final. While Goa romped home with a 5-2 aggregate win Goa, Bengaluru overturned a 2-1 deficit at the Kanteerava to go through 4-2 on aggregate against NorthEast United. And the Blues know well enough that they will have to dig deep and come up with another inspired performance in Mumbai on Sunday if they are to lay the ghost of last season to rest. Kick-off at the Mumbai Football Arena is at 7.30 pm, and the match will be telecast live on Star Sports, Jio TV, Hotstar and Colors Kannada TV.